3 Beds 4 Baths 2 Partial Baths 2,564 Sq. ft.
Beachhouse Masterpiece! Take the bridge to paradise!Wrap yourself in luxury in this truly tempting two-story in a gated gulf front community. Located on a quiet, pleasant street, this charming home is one you must see. This Architect-designed, spotless residence is enhanced by vaulted ceilings, an airy interior and a bright open floorplan. The master suite is on the first floor featuring a luxurious bath with 2 vanities, jetted tub and a separate shower. Enjoy your privacy in the adjacent sun room overlooking the beach. Upstairs has 2 bedrooms and a bath plus an extra room used sitting or sleeping. It is the perfect pairing--you and the wonderful custom kitchen with breakfast bar, Corian counter top, center island and built in China cabinet. The study is enhanced with bookshelves and a built in desk. 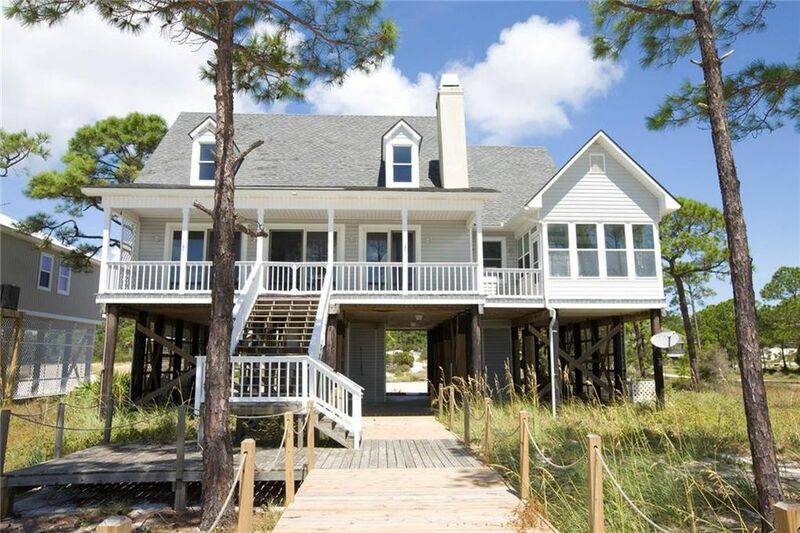 Catch your breath and a breeze on the large porch overlooking the Gulf. The expansive views are spectacular! Come join the Island lifestyle! Enjoy sun bathing, walks on the beach, surf fishing, crabbing as you watch the shrimp boats pass. Carport area has an entrance and half bath. The native landscape is one of the best green investments that make for environmental sustainability. The combination of luxury and practicality creates a showcase for elegant living and brilliant craftsmanship. All room dimensions are approximate, only. LISTING BROKER MAKES NO REPRESENTATION TO SQUARE FOOTAGE ACCURACY. BUYER TO TAKE FULL RESPONSIBILITY TO CONFIRM SQUARE FOOTAGE AND ROOM DIMENSIONS. Directions: South of Mobile, AL to Daphin Island, across the 4 mile bridge. conitnuing to the 3 way stop, left on Bienville, approx 1 mile, left on Audubon Dr, at end through gate and curve to the right and house on left near cul de sac.